As the second movie out of the five planned for the “Fantastic Beasts” series, it fails as a movie, is confusing as hell, but still succeeds to set up the rest of the series. Kind of. It is the series we wanted, but didn’t need. And to be honest, I believe it is still unnecessary due to the overwhelming confusion that this film had. They attempted to introduce too many new characters, had more exposition to give to the audience, and just overall tried to tackle too many plotlines. But I believe that is due to J.K. Rowling’s writing itself (since she also wrote the screenplay), trying to over-complicate the series by trying to cover plot-holes that were questioned in the Harry Potter series. But even that wasn’t successful because I definitely left the theatre feeling even more confused than before I walked in. Even the first film didn’t make me feel like this. “Fantastic Beasts and Where to Find Them” was a fantastic (no pun intended) start to a new look into the wizarding world. It gave us a fun, enigmatic side to some great, classic scenes that, although will never top the Harry Potter series, still gave me joy. The 1920s New York set-up seemed fine to me, but the 1920s Paris and London seemed a little…lackluster. Even though the circus scene was stellar in its own way, where were the can-can girls? The exciting social, literacy and arts revolutions? I saw nothing of the Roaring Twenties: just a dreary, sad, rainy Paris and London. 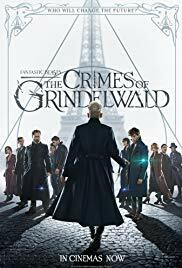 “The Crimes of Grindelwald” starts with Newt Scamander (Eddie Redmayne) trying to get permission to travel overseas with all of his animals since last time in New York it didn’t go so well. We get a short introduction to his brother Theseus Scamander (Callum Turner) and his fiance Leta Lestrange (Zoë Kravitz) and that’s about it for a large part of the movie. They try to offer him a job at the Ministry, he says no, they say fine you can’t travel to other countries because your animals are too dangerous. But that doesn’t matter I guess because Dumbledore asks Newt to go out of country to help Credence Barebone, and he goes via portkey bucket. Oh yeah, Credence – the moody teenager with a serious goth look is an Obscurial because his powers were blocked by his crazy step-mom – is alive, although that didn’t surprise me that much since the first movie revolved around him so much. Credence, however, has his own agenda. Now he’s best buds with Nagini and wants to find his real parents. And yes, I’m talking about Voldemort’s favorite pet Nagini before she’s a permanent snake woman, otherwise known as a Maledictus, cursed to permanently transform into a snake later in life. I would have felt bad for Nagini in this film due to her abuse being shown off in a circus except, y’know, I watched Harry Potter. And I do not regret cheering when Neville sliced her in half with that beautiful sword. And let’s talk about Dumbledore. He has this thing called a blood pact with Grindelwald from when they were kids, making them promise to never hurt one another. From the scene in the movie, it seems like they’re a bit more than friends: more like lovers. Which makes no sense. Rowling has had a tendency recently to try to be too involved in her past books. Recently, she came out on Twitter saying that Dumbledore was gay even though there was absolutely no sign of this in the many, many books she wrote. Same with her claims of Hermione way after the movies were released: she tried to say she could be a black character, again, with nothing said in the actual books. You can’t admit facts after the books are written. If they aren’t in the books and you attempt to be a liberal by saying it on your social media, that doesn’t make it true. It makes you a fake liberal and a hypocrite. Queenie also pretty much drugs Jacob to convince him to marry her, even though marriage between muggles and wizards is illegal in the States and he doesn’t want to see her in jail. This movie completely ruined her character. In the first film, she is lovely, enigmatic and charming. In “The Crimes of Grindelwald,” she was turned into a confused and crazed puppet. She left with Grindelwald in order to secure a future to marry Jacob. This seems odd since she can technically read minds, and she should have been able to immediately see the deception behind Grindelwalds actions. And even if his thoughts were being concealed, wouldn’t she be suspicious of his attempts to hide his thoughts from her? Moving on, the movie also fails big-time in just making me care about certain characters. You can’t introduce a character in the same movie and expect me to be sad about their death as well while trying to juggle so many storylines. It’s too much happening with not enough time to properly give these characters their spotlight. Another problem is the pacing of the story. The climactic battle didn’t feel like it. There was no big fight or any reason for one at all, and it confused me when the movie ended a few scenes after that. Where is the legendary wizarding world magic fight? I got pretty much nothing. Just a semi-cool dragon that they say could eviscerate a city but gets defeated in less than a minute. Unfortunately, all of this leads to a big pile of bad writing for this poor movie, with too many agendas and plotlines trying to be pushed and completed in this series by Rowling. With a big surprise at the end that left my jaw open the entire time walking out of the theatre that kind of made the film interesting, I can only hope that the future is brighter than this bleak stain of a film on the wizarding world.